C1107. ARTUR RODZINSKI Cond. Chicago Orch. 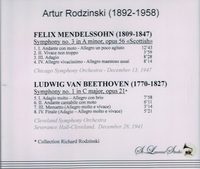 : Scottish Symphony #3 in a (Mendelssohn), recorded 13 Dec., 1947; Rodzinski Cond. Cleveland Orch. : Symphony #1 in C (Beethoven), recorded 28 Dec., 1941 (from a rare existing copy from Rodzinski collection). (Canada) St Laurent Studio YSL 78-124. Transfers by Yves St Laurent.